Improperly characterizing a potentially hazardous asteroid (PHA) remotely can easily doom a deflection mission from its inception. A "bag" or "net" method of capture relies on accurate size and shape estimates, a "docking" method relies on a slow spin rate and relatively smooth landing surface, and an "impactor" method relies on a higher density with a predictable center of mass. Every one of an asteroid's properties is important and can influence the deflection mission architecture as well as risks upon impact with Earth. This is magnified by the degrees of uncertainty that are inherent to every type of observation. Even if the math is accurate, there are underlying assumptions to each calculation. It's important to understanding these assumptions and what implications they may have to the overall mission. Wait...how did we find this asteroid in the first place? Read about asteroid detection here. Upon discovery, an asteroid's magnitude (brightness) is measured and size is given as a range. This size range (ex. 20-62 meters) is due to the lack of information on its albedo, or light reflectivity. In other words, you could have a small, very reflective asteroid or a large one with little reflectivity with the same magnitude in visible light. 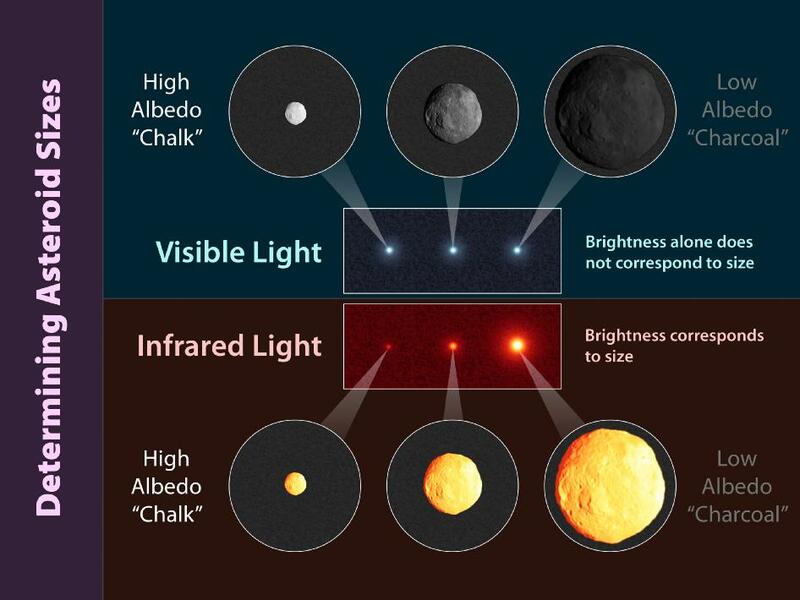 The visible light measurements typically need to be combined with either infrared or radar measurements in order to better understand the asteroid's size and decrease the margins of error. An asteroid's shape and spin can be determined through a variety of methods. The most accurate method of determining the shape, size, and spin is by observing it with radar. By focusing a narrow beam of radio waves at an asteroid and catching the waves that bounce off it with a receiver, size and shape can be very accurately mapped. If this asteroid is close enough, the radar facility can produce a really amazing-looking GIF of the asteroid spinning. If it is not so close, the astronomers can at least calculate a shape and model its rotation with various visualization software. This also gives a much more accurate measurement of the asteroid's orbit and essentially drops the uncertainty level of an asteroid's orbit to 0. The major issue with radar, as mentioned in a previous post (Planetary Defense - Detection), is that there are very few powerful radar transmission/receiver stations on Earth, and this method has a short range. Only asteroids that pass very close to Earth can be observed with this method. When an asteroid cannot be measured with radar (which is most of the time) astronomers resort to generating a lightcurve. This is basically a measurement of the asteroid's magnitude of brightness over a period of time at regular intervals. There are two types of magnitude: relative magnitude and absolute magnitude. Relative magnitude is the brightness in relation to the observer. If an asteroid is very far away, it will appear to have low relative magnitude (faint), and if it is very near, it will appear to have high relative magnitude (bright). If an astronomer knows how far away the asteroid is--based on the calculations of its orbit and current position--they can calculate the absolute magnitude, which is the brightness if observed from 1 AU (93 million miles) away. This should remain constant for any given object, assuming it's spherical and is in the same place relative to the sun. However, most asteroids are not spherical and they're constantly changing their position in relation to the observer (on Earth) as both the Earth and the asteroid orbit the sun. This means that there are very small, measurable changes to the asteroid's absolute magnitude over time. Below is a lightcurve for the asteroid 201 Penelope. Below is a shape model for the same asteroid as calculated from multiple lightcurves.. This illustrates the difficulty in doing remote sensing...which is to take readings and measurements (numbers) and translate them into something recognizable (a chunk of rock). It's scientists behind computer screens doing these very tedious and meticulous tasks which will end up saving our world from a devastating impact...not Bruce Willis and Ben Affleck. Determining what an asteroid is made of might be one of the most important characteristics of an asteroid, yet is also one of the most difficult to determine. There are two major ways to describe an asteroid's composition: physical and chemical. A good geologist here on earth would not rely on visual examination of rock samples to say what they're made of. They would start by dusting them off and breaking them in half. By doing so, it exposes a "fresh" surface and makes it easy to see what is inside, free from the effects of weathering. This would be the ideal situation in which to study asteroids, but that's quite impractical. It's very difficult to know whether an asteroid is made of one solid piece of metal or rock instead of a loose pile of gravel held together by weak gravity…especially if it's covered in a thick layer of dust. It's also very difficult to understand if an asteroid's surface is made of the same material as the interior. Mass can be determined by measuring the effects of gravity from another body (like Mars or a small asteroid moon), but in the absence of these measurements, astronomers must make some assumptions and start calculating. In most cases, an asteroid is not close enough to be observed with radar, so astronomers must rely on measurements which can only be made from long distances…which, of course, typically relies on certain assumptions. Mass can be calculated from density when a chemical composition is known from spectral analysis. This composition can then be used to make a rough comparison to known compositions of other asteroids that have previously been characterized by radar or visiting spacecraft. Without being able to directly retrieve a sample to analyze it, astronomers have to rely on other techniques like astronomical spectroscopy. This is done by looking at the light being reflected off an asteroid and passing it through a spectrograph. A spectrograph separates the light into a frequency spectrum, which will show all the wavelengths/colors of light and have black bands at certain frequencies. Certain elements absorb specific wavelengths of light, so by analyzing where these black bands show up on the spectrum, astronomers can determine the elements that make up the asteroid's (or any other celestial object's) surface. Density = mass/volume. Volume is based on size/shape. In the absence of radar or infrared observation, size/shape is based on lightcurve data and albedo. As you can see, small assumptions and margins of error at each step adds to wide variability in the end. Each additional piece of information continues to chip away at this overall margin of error and can help develop a clearer picture of an object. Once a certain number of characteristics are determined about a particular asteroid, it can be compared to the large database of already known and well-categorized asteroids and patterns begin to emerge. These patterns make it easier to make generalizations about the asteroid without knowing some of the details with certainty. Here is an example of a pattern used to make generalizations: based on what is known about gravity, a loosely packed "rubble pile" asteroid will fling itself apart if it is too large and spins too fast. If an asteroid is both very large and spinning very fast (2000 GD65 and 2005 UW163), then this knowledge effectively "rules out" the asteroid being a rubble pile. It must be a relatively homogenous, monolithic (solid) body with a high density. When thinking about how to potentially divert an asteroid on a collision course with Earth, the issue of physical composition is particularly concerning. Most of the known asteroids are below the "rubble pile spin barrier" and have bulk densities less than the density of their constituent grains. This suggests that most asteroids are porous rubble piles. This is highly problematic for the easiest and most simple "impactor" methods of asteroid deflection. The impactor method is basically hitting an asteroid with a very fast-moving object (or nuclear device) to knock it off its course. Depending on the size, shape, chemical makeup, and distribution of the various rocks that make up a given asteroid, a kinetic impactor could either cause the asteroid to shatter or possibly just absorb the impact. Below is a good visualization of different internal structures of asteroids based on the uncertainty surrounding asteroids and asteroid science. The composition of an asteroid's interior is assumed to be the same as its surface because you can't truly know what's inside an asteroid unless you drill into it or break it apart.